Wells Fargo & Company WFC is planning to combine its private bank and Abbot Downing, the ultra-high-net-worth unit. The move comes as part of Jon Weiss’ efforts to restructure the bank’s wealth and investment management business. Jon Weiss is the head of Wells Fargo’s wealth and investment management business. Notably, the combined unit will be run by a new lender, who is yet to be named. Both the current units will retain their operations but the new lender will report to Weiss once the combined unit is created. 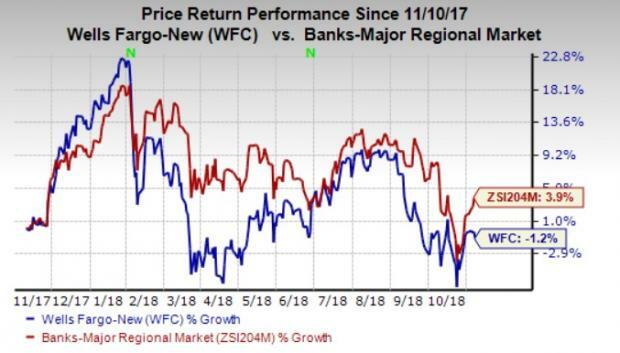 Shea Leordeanu, a spokeswoman for Wells Fargo, said that the bank will also create a new unit within its wealth management business for its direct-to-client products, Intuitive Investor and Wells Trade. Moreover, there will be a separate new unit, which will take care of mergers and acquisitions as well as lending. Despite efforts to control costs, Wells Fargo has been facing many challenges as well. This, in turn, has led to a continuous rise in expenses over the past few years. Notably, non-interest expenses recorded a five-year (2013-2017) CAGR of 4.6%, with the trend continuing into the first three quarters of 2018 as well. In fact, while the company remains focused on expense management with the target of eliminating $4 billion of expenses by 2019, its bottom line is expected to continue to be hurt in the near term primarily due to higher legal expenses related to the sales scam and other litigation issues. Shares of this Zacks Rank #3 (Hold) company have lost 1.2% against the industry’s 3.9% growth. A few better-ranked stocks from the same space are Citigroup Inc. C, JPMorgan Chase & Co. JPM and U.S. Bancorp USB. Each of these companies carries a Zacks Rank #2 (Buy). You can see the complete list of today’s Zacks #1 Rank (Strong Buy) stocks here. Over the past 60 days, Citigroup has witnessed an upward earnings estimate revision of 1.7% for the current year. Its shares have gained 26.4% in the past two years. JPMorgan’s earnings estimates for 2018 have been revised 1.3% upward over the past 60 days. Shares of the company have gained 46.6% in the past two years. U.S. Bancorp’s share price has increased nearly 11.2% in the past two years. For 2018, its earnings estimates have been marginally revised upward, over the past 60 days.